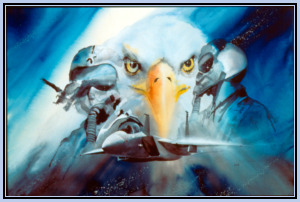 The bald eagle and the F-15 Eagle are two majestic and awesome birds. The F-15 has proven itself to be an outstanding aircraft in combat, and in the hands of a skilled pilot is one of the most effective weapons in the sky. Dan Kelly’s striking original water color has captured the essence of man and machine as one. This is more that a print it is symbolic of man’s desire to fly and to be the best he can be.